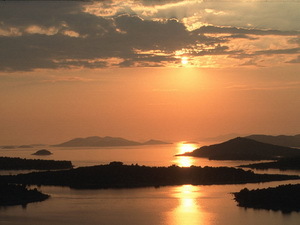 National park Kornati is located in region North Dalmatia. 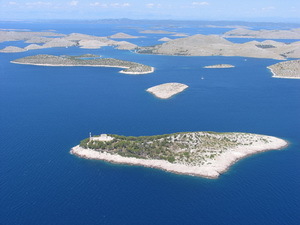 Kornati are located between Zadar's and Sibenik's region. Total area of National park Kornati is 21 700 hectares. National park Kornati was declared as national park in 1980. You can get to Kornati islands by a boat. 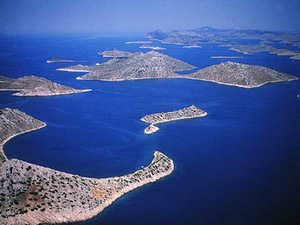 National park Kornati is consisted of 89 islands, islets and cliffs. It has area of 220 km2. Islands, islets and cliffs make 25% of total park's size. Most of it is under the sea. Kornati are located between islands Dugi Otok, Zirje and Pasman. Largest islands are Kornat (32,50 km2) and Zut. 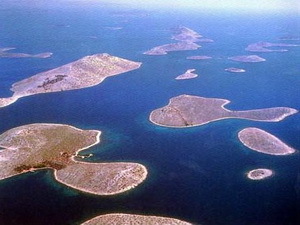 They consist 70% of total land area of national park Kornati. Highest peak in national park Kornati is peak Metlina (237 m) located on island Kornat. 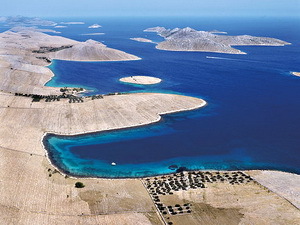 Area of Kornati have hot summers and rainy autumns. Average year temperature is around 16ºC. There are no many cloudy days in area of Kornati. Winds that blow in this area are bora, scirocco and mistral. Most often wind is bora. Kornati have around 2600 sunny hours per year. 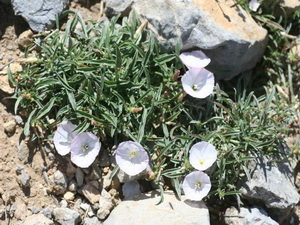 In continental part of Kornati there are around 700 plant species. Some of them are Centaurea Ragusina, White Helleborine, Iris Illyrian, Convolvulus lineatus, Euphorbia dendroides and many others. Sea plants are mostly different species of algaes. 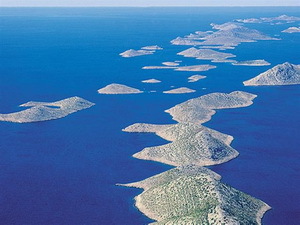 Kornati consist around 50% of total Atlantic concrete species. Continental animal life in Kornati is consisted mostly of scarabs. But more and more this area will be researched for history of animal life in Kornati. Sea fauna is consisted mostly of corals, molluscs, crabs, brown bullheads, fishes. Corals in area of Kornati make 39% of total corals in Atlantic. Oldest sediments in Kornati were made in Mesozoic, around 100 million years ago. 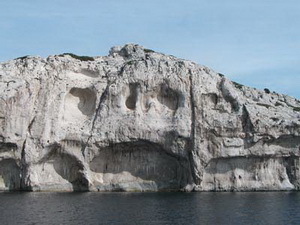 65 million years ago area of today's Kornati was hauled and folded. 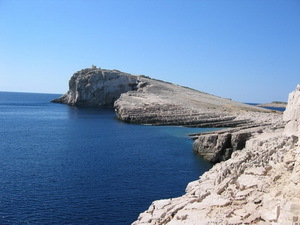 At the end of Eocene, Kornati area emerged totally. 15 000 years ago sea level was lower than today, because of all the ice during the Ice age. Kornati were part of the mainland. At the end of the Ice age, ice melted and left just peaks of former hills. There are foundings that show that area of Kornati was inhabitated since neolithic. In valley Zejkovci on island Kornat, stone axe was found. First colonization of Kornati islands was in time of Ilirs. There were also found old dwellings, forts, walls. Main occupations were live-stock farming and fishing. Remains of Roman activities in this area are mostly under the sea, like salt pan in Sipnate, dock in Piskera... On mainland there are remains of villa rustica in Proversa and fish pool in Svrsata. 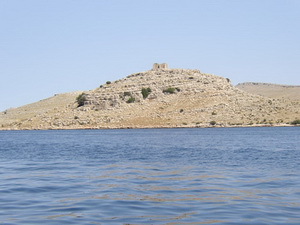 Most known founding of Byzantine time in Kornati islands is fort Tureta. Fort Tureta had been used for protection. In the bottom of fort Tureta is basilica Church of St. Mary. After Croats inhabitated Kornati, Venetia started to dominate Adriatic coast. So there was no permanent inhabitants on Kornati until 13th century. Main remain from Medieval is Church of the Lady of Tarc. Mass is still kept in this church each first Sunday in July. In 16th century Venetians built fort on island Vela Panitula in order to pick fishing taxes. 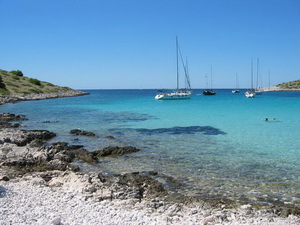 In the beginning of 16th century settlement Sali on island Dugi Otok became most important fishing center in Adriatic. Until 17th century Zadar's manors possesed Kornati islands, but after new changes in Dalmatia, they had to sell it. 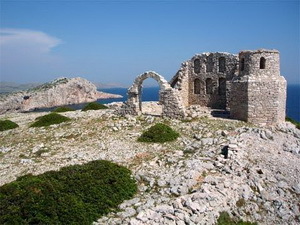 Murter's manors bought Kornati islands and were in charge of 90% of Kornati islands. 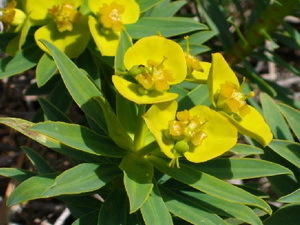 Most popular attractions of Kornati islands are „krunas“ (coronas). Kruna (corona) is vertical cliff of Kornati islands turned towards open sea. Krunas (coronas) are made because of the global movement of Africa towards north. Longest kruna (corona) (1350 m) is the one on island Mana. Highest one (82 m) is on island Klobucar. Deepest one (over 90 m) is on island Piskera. Magazinova skrila is type of slides where limestone slided upon its background, during the time of earthquake. You can visit this location Striznja, Vruje or Kravjacica on island Kornat. Highest peak on island Kornat is Metlina (237 m). Other gazebos on Kornati islands: Otocevac (island Piskera), Litnji vrh (island Vela Smokica), Opata (island Kornat). Inland part of National park Kornati is a private property so you should be carefull and considerate while passing its parts. National park Kornati is ideal for cruising around all 89 islands and islets. Only thing you need is ticket to National park. Diving is allowed only in organized groups. Snorkeling is allowed. You can also swimm, walk, watch animal and plant life in Kornati islands. You should visit some of the Kornati restaurants and taverns and try their specialities. 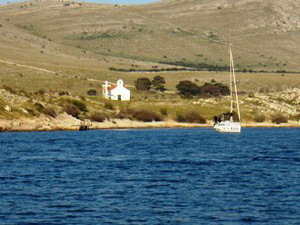 In National park Kornati it is allowed anchoring and staying over the night, but only in 16 bays specified for it. Those bays are: Lupeska, Statival, Tomasovac - Suha Punta, Stiniva, Lucica, Sipnate, Striznja, Vruje, Opat, Gujak, Kravjacica, Ravni Zakan, Smokvica, Piskera – Vela Panitula, Lavsa and Anica. Areas around islets Purara, Mrtenjak, Klobucar, Veliki and Mali Obrucan and cliffs Klint and Volic are protected from human activities. It is forbidden to enter this areas for all visitors of National park Kornati. Hiking in area of National park Kornati is allowed only by paths and roads specified for it. Recreation fishing is allowed in all areas, except in strictly protected areas, but with fishing licence which you can get on receptions of the park. It is forbidden to carry guns, making a fire, picking plants, hunt animals, polut sea and land. - 300 HRK if bought in NP Kornati. All listed prices are approximate and with possibility of constant changes.